During our visit to the Park Hyatt Ningbo, I was fortunate enough to try out the on site “Yue Hu Spa.” The Park Hyatt Ningbo rests upon the Dong Qian Lake in Ningbo, China. Everything about this resort feels tranquil. From the water that surrounds the property to the mountains peaking out in the distance, it is almost impossible not to feel at peace here. The resort is situated just far enough away from the city center where visiting the spa, or even planning your trip around the spa makes sense here. This resort is breathtaking and feels like a hidden secret. Like most of this property, the spa is spread out among different buildings or “villas.” When you enter the reception, it feels open with lots of natural light and yet still very warm from the rich wooden accents. The staff was welcoming and walked me through the various treatments while also preparing my daughter a cup of tea. The spa offers a wide variety of treatments and packages. Your selected service will determine the room, villa or pool where you will be taken for your visit. Villas vary in accommodations, some feature a pool, others a hot tub, still others a sauna. The menu includes body and foot massages, facials, soaks, wraps and exfoliation scrubs. The full menu is available here. Lucy looks over the menu and helps with the welcome tea. While I laid down on the warm table, my masseuse began to warm the herbal pouches. I have had many massages across Asia and in the States and had yet to encounter pouches like these. As the massage began the aroma from the heated pouches began to fill the room. Traditional Chinese techniques and use of the warm pouches on my back made for a relaxing experience. As our visit was during low-season, the spa offered us their largest private villa. My husband had intended to take my daughter to the play area on the resort while I had my massage, but they encouraged my husband and daughter to tag along to enjoy some of the amenities at this villa. A view from the outside of the villa. 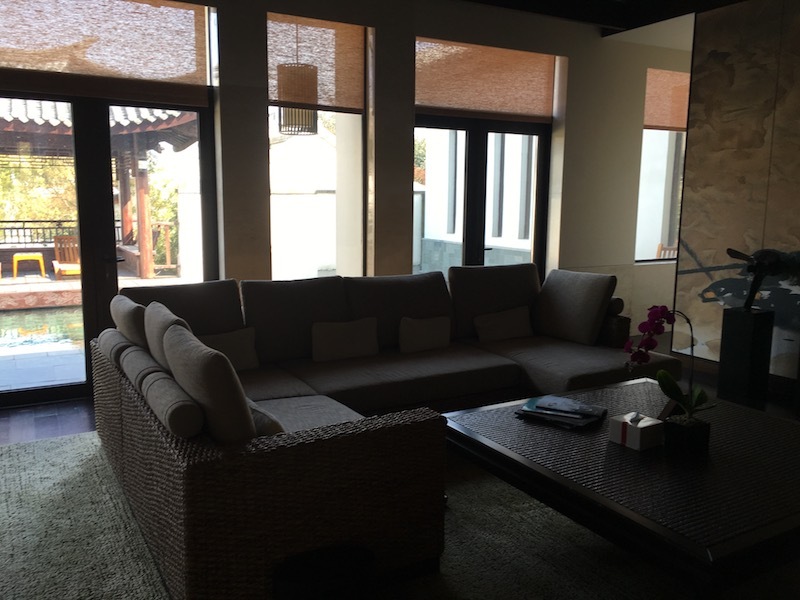 A sitting area located in the front of the private villa. The private pool included with the villa. A room for soaking treatments inside the villa. 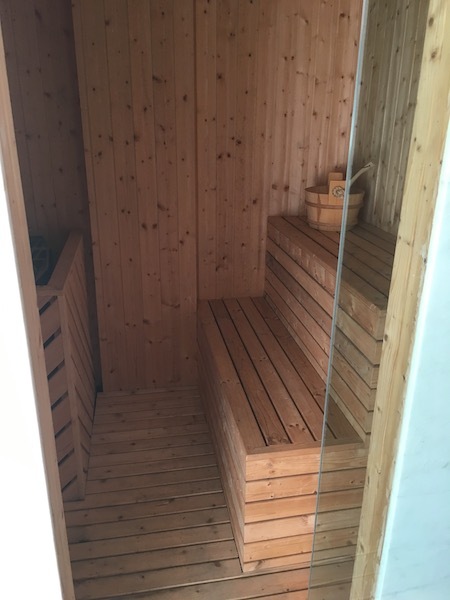 A steam room and a shower. Just outside a private reflection pond. One of the massage tables in the villa. The space featured a stone hot tub and additional outdoor space surrounding side of this villa, however the hot tub was being repaired during our visit. The spa attendant encouraged me to take my time before and after my massage to enjoy all the villa had to offer. In this setting it’s impossible not to sense the luxury and attention to detail. It was really much too large for just the three of us, but would be perfect for bridal parties or larger groups. The Yue Hu Spa did not disappoint. The experience was five-star luxury from start to finish. Serene and picturesque it stands alone as a destination spa for non-hotel guests. When added to the other amenities on the resort grounds such as the infinity pools, saunas, whirlpools and steam rooms, the Park Hyatt Ningbo Resort and Spa is a true destination for spa travelers. We enjoy going off site to explore but with all this property has to offer, there is little need to do so. Have you chosen a hotel based on a specific amenity? Would this spa bring you to Ningbo? Ningbo is really popular for Chinese men to take their mistresses to.